There are many problems to be solved before driverless cars are widespread – and a shortage of engineering talent is one of them. The claimed benefits for driverless cars cover everything from sustainability to safety. The approaching autonomous era will reshape our lives, boost productivity, and change our ideas around vehicle ownership, enthusiasts say. The peak body representing over 100 organisations from within and outside of Australia and New Zealand’s driverless vehicle ecosystem, the Australian Driverless Vehicle Initiative (ADVI), estimates it’s an opportunity worth perhaps 16,000 jobs and $95 billion to the country. The excitement has seen multi-billion dollar acquisitions and investments worldwide, and many headline-grabbing announcements from auto and technology companies. There’s also a massive shortage of talent, according to Udacity, the online training academy that started offering a ‘Self-Driving Car Engineer Nanodegree’ last year to address this. Developing the course with companies including BMW, Uber and nVidia, Udacity said the demand is such that engineers can earn a base salary of between US$67,800 and US$265,000. “There’s just a tremendous number of companies hiring engineers in this space and the number of engineers who have the skills to contribute to this industry has traditionally been very small, because it’s come out of a graduate program at few select universities,” said the course’s lead, David Silver. Silver described himself as a “normal Silicon Valley software engineer” who developed a passion for driverless cars a few years ago, though he had no experience in systems or robotics experience. Eager to get up to speed, he took as many artificial intelligence and robotics open courses as possible at outlets like Coursera and Udacity. He eventually got a job as an autonomous vehicle engineer at Palo Alto with Ford. However, he was invited by Udacity founder Sebastian Thrun to build out the nanodegree. Silver has been there since July 2016. Thrun is a former Stanford Professor who also founded Google’s self-driving car program. According to Silver, there have been over 7000 enrolments since its October 2016 beginning, with about half from North America, 20 per cent from Europe, seven per cent from India, and five per cent from China. The first cohort of the nine-month course graduated this October. Silver said many students have been hired by Udacity’s partners prior to graduating. The education provider also announced a taxi spinout, Voyage, last April. The nanodegree covers a different aspect of the technology stack every month. Deep learning (another field with a current talent shortage) is covered early on, including a behavioural cloning project. This is followed by topics including computer vision, sensor fusion, localisation, control, path planning, and finally a system integration challenge on a modified Lincoln MKZ. There is an emphasis on programming in C++, which Silver said many students aren’t proficient in pre-course, but has become really crucial in the industry. “Skill with that language is really, really important, maybe an overriding quality that automotive engineers need to have,” he said. 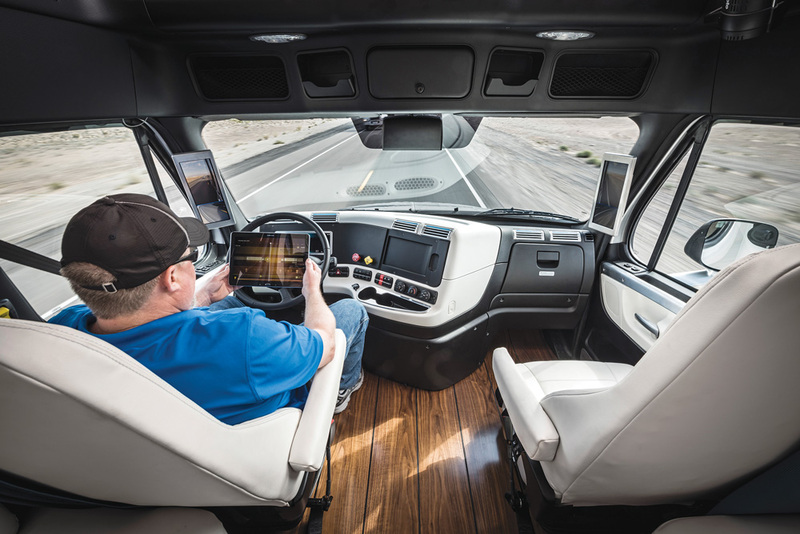 The Daimler Freightliner Inspiration is a Level 3 driverless vehicle, meaning the car can manage most aspects of driving, but a passenger must be available to take over at any time. Andrew Wilkie, an IT Project Manager at Allianz Australia, joined the US$2400 course’s third intake last December. He took his first MOOC (Massive Open Online Course) in 2011. Coincidentally, it was Thrun’s ‘Intro to AI’ experiment at Stanford, which received 160,000 enrolments. He said it “changed my world” and he has since completed courses including in IoT from University of California Santa Barbara and mobile robotics from Georgia Tech. He was drawn to self-driving vehicles as he sees it as “the ultimate robotics platform”. Wilkie was up to the system integration part of the course when we spoke to him. He was unsure if he’ll work as a driverless car engineer when he’s through, though is open to the possibility. Regardless, he said the deep learning skills are broadly applicable. “It’s disrupting all industries and all organisations,” he said. “I work within insurance, and we can actually apply that to cases internally to enhance our products and our offerings. Within Australia, there are several trials of autonomous vehicles running. Within South Australia – which led the way with a self-driving Volvo demo in 2015 – driverless shuttles operate around Adelaide Airport and Flinders University. Shuttles are also operating in Perth, Sydney and Darwin. A two-year EastLink trial of driverless cars also began in Melbourne this year. According to an NRMA study, a million driverless cars will be on roads by 2035. SA self-driving Volvo demo in 2015. Acceptance among Australians is currently high by international standards, according to ADVI, which surveyed the attitudes of 5500 people in August 2016. Around 46 per cent believed that the technology would be safer than a human driver, however, people were not yet willing to put their children into such vehicles or to completely relinquish control. “I think that’s a fair estimation of where the community is at,” said Rita Excell, executive director of ADVI. She characterised Australia as “first followers”, though she added the country’s adoption of driverless mining vehicles is world-leading. 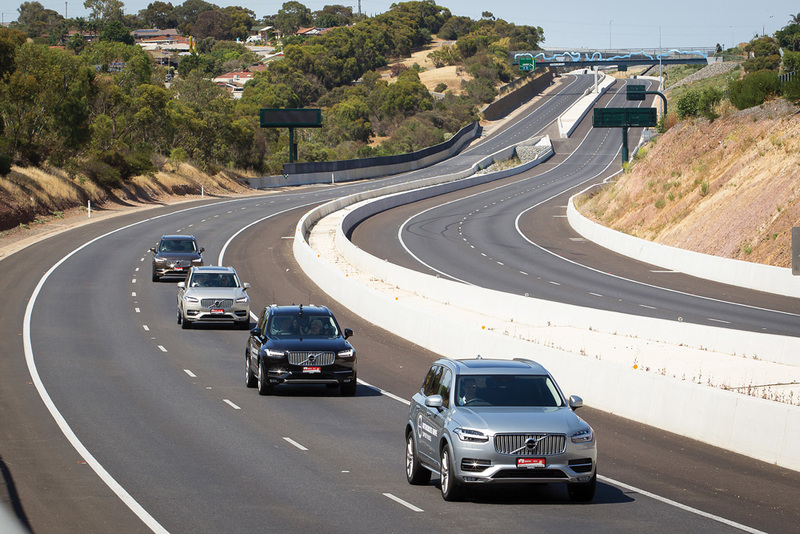 “I often pointed out to the Americans that we have more autonomous vehicles in Australia working and operating than they do in California,” Hugh Durrant-Whyte told create earlier this year. The take-up – whether or not it matches the NRMA’s prediction – will transform our built environment, said Excell. Cities have been designed around accommodating the transport task; change this and you change the city. Parking space needs will change, as will roads and other infrastructure. According to ADVI, road upgrades, to take one example, will be conceptually different. Autonomous transport relies on clear markings and signage, and this will require different maintenance considerations. It also argues that recent planning initiatives, such as as the Growing Sydney district plan, have been made without driverless car adoption in mind. “We believe that a whole-of-government approach is required that’s not just about road transport. It’s about cities, urban planning, systems and society,” Excell said. There is also the need for consistent laws across states and territories. Asked about this, Marcus Burke, the National Transport Commission’s Project Director – Compliance & Technology told create that Australian Governments recognise a “nationally consistent regulatory framework that embraces innovation and ensures automated vehicles are safe” is required. A phased reform program was agreed to between ministers last year so “conditionally automated vehicles can operate safely and legally on our roads before 2020, and highly and fully automated vehicles from 2020” Burke said. Though there are trials running in several places in the world, these are often in areas with clear weather. Conditions such as fog, snow and rain remain technical challenges. Two other issues to be addressed are in path planning for urban areas and computational power. Urban areas have more pedestrians, cyclists, intersections, signs and other complications. “Highway driving for autonomous vehicles is somewhat more structured and a little easier to figure out, because highways have really well-defined rules and coordinated entrances and exits and a smaller number of actors on the actual road,” said Silver. The lidar, radar and cameras generate a lot of data, which has to be processed to generate decisions in real-time. 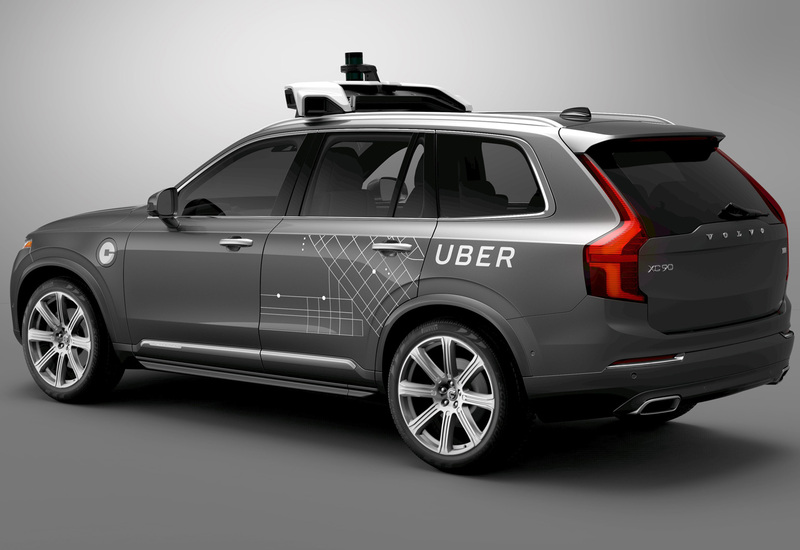 Volvo and Uber joined forces to develop a self-driving taxi. 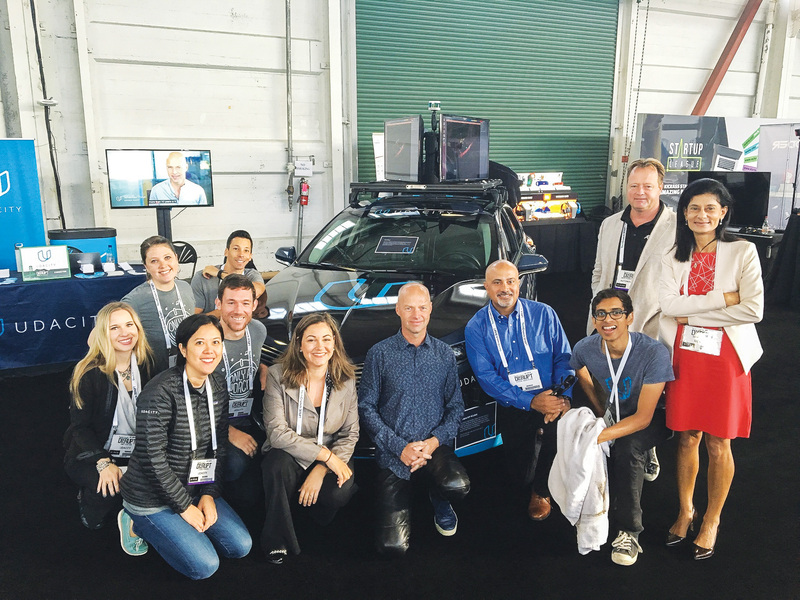 “Those three things I think – weather, urban driving and computational platforms to process high volumes of sensor data – are some of the major challenges that self-driving cars leaders are researching right now,” he adds. Despite all the progress, there are major problems to solve before we do without our steering wheels and pedals. And like any good challenge, it’s one where lots of disciplines will have to work together. “There’s also the security aspect of it; not just the cybersecurity but also personal security, security of data, global positioning systems, the accuracy of locations,” offers Excell. Experience driverless cars for yourself and learn more about the engineering challenges involved during an offsite technical forum at this year’s Australian Engineering Conference. To register, click here. Artificial intelligence will be able to do many things – destroying the world won’t be one of them, says Professor Toby Walsh. In the 2013 movie Her, a lonely man called Theodore (Joaquin Phoenix) falls in love with his new operating system Samantha (Scarlett Johansson). Critically acclaimed, the movie won an Academy Award for Best Original Screenplay and was nominated for Best Picture. However, the acclaim wasn’t limited to the arts community. 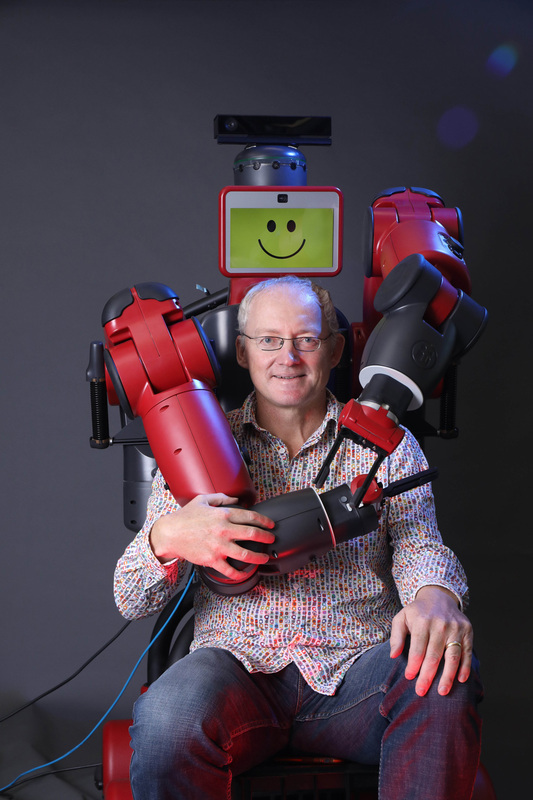 According to one of Australia’s top artificial intelligence (AI) experts, Toby Walsh, the film resonated with his community too. “Unfortunately, if you ask AI researchers which AI movie they like, they complain that most of them paint such a dystopian picture of what AI’s going to do to the planet,” he said. Walsh said the way we interact with computers has evolved from plugging wires into the front panel of the computer, to machine code programming, MS-DOS with its command line interface, and ultimately the graphical user interface we are all used to today. “The next layer is going to be this conversational one. You already see the beginnings of that in systems like Siri and Cortana,” he said. “As we move more to the Internet of Things, your house is full of devices that are connected to the internet that don’t have screens or keyboards. The front door, the light switch, the fridge, all of these are going to be networked together. There’s only one interface you can have with these, which is voice interface. He said it’s hard to think of an area that artificial intelligence is not going to touch in some way. “It’s going to touch education, it’s going to touch healthcare, it’s going to touch pretty much every form of business you could imagine,” he said. Walsh said there are a lot of misconceptions out there about what artificial intelligence is able to do. “If you summed up all the things that you read in the newspapers, then you’d imagine it’s only a matter of moments before the machines are going to be taking over, which is far from the truth,” he said. “There are still a lot of significant hurdles to overcome before we can actually make machines as intelligent as us, and likely more intelligent than us. We recently saw the announcement of AlphaGo Zero, where they just gave it the rules of the game Go and it learned everything from scratch in just three days, then beat the program that beat Lee Sedol (World Go champion) 100-0. He suspects it will be at least 50 years before we will get to machines that will be as intelligent as us and possibly longer. Walsh was born in southeastern England, just outside London, and confesses that as a boy he read too much science fiction. “From about the age of seven or eight I started to read about robots and intelligent machines,” he said. After studying maths and physics at Cambridge University, he did his PhD in artificial intelligence at the University of Edinburgh. There he met an Australian philosophy professor who invited him to Canberra to teach at a summer school each year for the next ten years or so. “I would come out for a couple of weeks or a month in the middle of December and January, and escape the British winter,” he said. 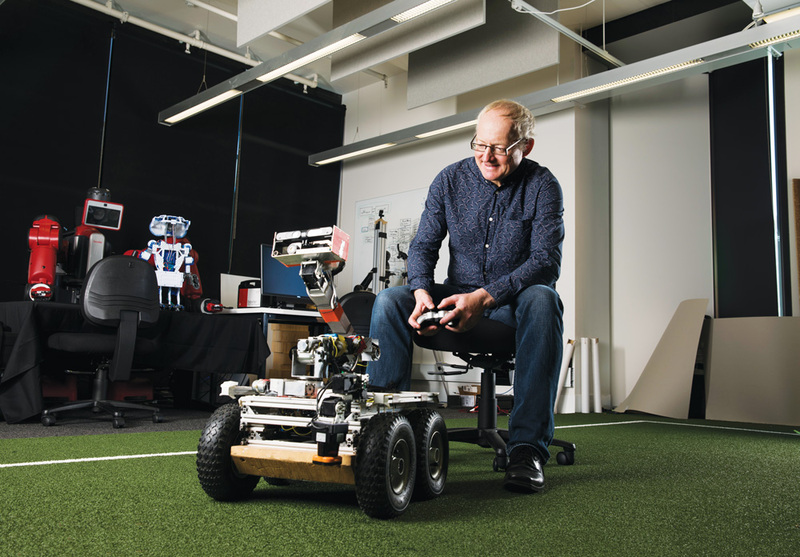 Eventually, he landed a permanent position at National ICT Australia (NICTA) now part of the CSIRO’s data innovation group, Data61, and the University of NSW where he is Scientia Professor of Artificial Intelligence. He is particularly interested in the interface between distributed optimisation, social choice, game theory and machine learning and believes now is probably the most exciting time to be an AI researcher. “I started as a postgraduate researcher at what was the tail end of the AI boom, the expert system boom,” he said. Of course, this increasing interest opens the door to misinformation being spread about AI as well. So, last year Walsh decided he “had a duty” to write his own definitive guide to the field: It’s Alive! Artificial intelligence from the logic piano to killer robots. One big question, which takes up a large chunk of Walsh’s book, is what will happen to human jobs in the future if many tasks can be performed better by machines? “We don’t really know the answer to this,” he said. However, he acknowledged there is a chance it could be different this time around. “Previously when our brawn was replaced we still had a cognitive advantage over the machines,” he said. He said the caring professions, artistic professions and scientific professions should all survive, professions where there is no natural limit to the potential of the job, unlike say ploughing fields or assembling widgets, repetitive tasks that could be done by robots and then the humans are no longer needed in that role. Interestingly, he feels some ancient jobs will grow in stature while some newer jobs might be very short-lived. “One of the newest jobs on the planet is being an Uber driver. But Uber are already trialling autonomous taxis. The driver is the most expensive thing in the Uber. It’s clearly part of their business plan to get rid of them as quickly as possible. That’s probably one of the first jobs that’s going to completely disappear,” he said. “Whereas, one of the oldest jobs on the planet, with a very venerable history, is a carpenter, that is probably going to be one of the safest in the sense that hand carved objects are going to be increasingly valued. We’ll appreciate those things where we can see the touch of the human hand, and if we believe economists, their value will increase. 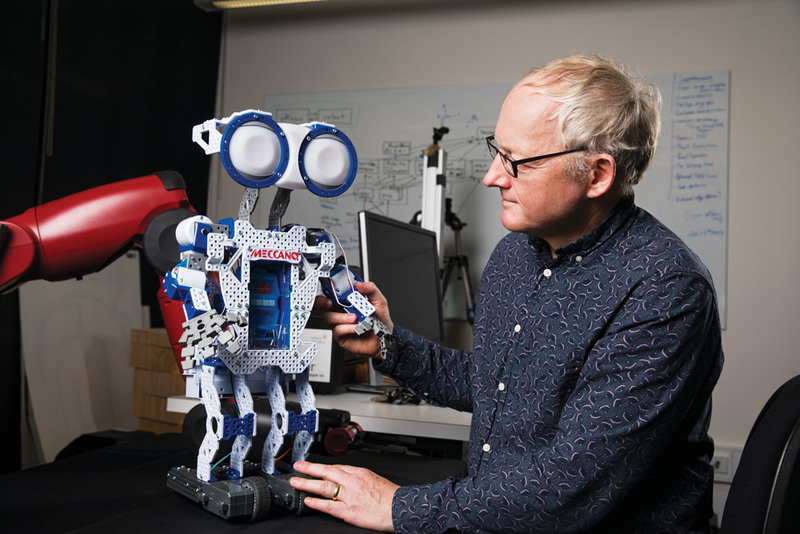 Toby Walsh with a Meccano robot he and his daughter assembled. This is where the choices he mentioned previously come into play again. “We need to think about how we might need to change education so that people are educated for whatever the new jobs are; whether we’re going to have more free time; whether income is going to be distributed well enough,” he said. Another area for discussion is how far we want AI to evolve. Do we want it to get to consciousness and what would the consequences of that be? “Supposing machines become intelligent, but not conscious, then we wouldn’t have to be troubled, if for example, we turn them off or we make them do the most terrible, repetitive, dangerous, or other activities that we wouldn’t ask a human to do,” he said. Walsh said there are issues regarding the use of artificial intelligence where we should be concerned. Most notable is its use by the military. In 2015, he coordinated an open letter to the United Nations signed by more than 1000 leading researchers in artificial intelligence and robotics including Apple co-founder Steve Wozniak and Tesla CEO Elon Musk as well as other luminaries such as physicist Stephen Hawking and philosopher Noam Chomsky. The letter called for a universal ban on the use of lethal autonomous weapons. “Certainly today machines are not morally capable of following international humanitarian law,” he said. He said the world has agreed in the past to ban certain nuclear, chemical and biological weapons after seeing the horrific impact they can cause. And they also preemptively banned blinding lasers after realising the potential horror. Playing around in the UNSW robotics lab. His activism on the issue has seen him invited to the United Nations in both New York and Geneva to argue the case for a ban on autonomous weapons. “It’s very surreal to find oneself in such an auditorium having conversations with ambassadors,” he said. It has also opened his eyes to the reality of international diplomacy and how difficult it can be to get things done. “Pleasingly they have gone from the issue first being raised less than five years ago, to three years of informal discussions, and now last year they voted unanimously to begin formal discussions, what’s called a group of governmental experts,” he said. He said they warned a couple of years ago in their open letter that there would be an arms race. Now, the arms race has begun with prototype weapons being developed by militaries around the world in every sphere of the battle, in the air, on the sea, under the oceans, and on the land. “There’s plenty of money to be made out of selling the next type of weapon to people. There’s a lot of economic and military pressure. You can see why the military would be keen to have assistive technologies,” he said. And he acknowledged there are some arguments for autonomous weapons. “You can see, certainly from an operational point of view, there are some obvious attractions to getting soldiers out of the battlefield, and having weapons that follow orders very precisely, weapons with super-human speed and reflexes, weapons that will fight 24/7, weapons that you can risk on the riskiest of operations, that you don’t have to worry about evacuating from the battlefield when they’re damaged,” he said. However, it is ethical questions such as this that make working in the field so interesting. “It is like the famous Chinese curse, ‘May you live in interesting times’,” he said. AI, robotics and the future of engineering is a key theme at this year’s Australian Engineering Conference. To register, click here. The Barangaroo South urban renewal project has nabbed a handful of awards from the Property Council of Australia. A focus on sustainability and innovation has paid off for Lendlease after its Barangaroo South urban renewal project won five Property Council of Australia (PCA) Innovation & Excellence Awards, including the top gong for Development of the Year. The multibillion-dollar project, due for completion in 2023, is Sydney’s largest urban renewal project and is one of the largest commercial developments to happen in Sydney over the past decade. As reasoning for the win, PCA Chief Executive Ken Morrison said Barangaroo has earned icon status by setting the standard for what’s possible for precinct-wide urban renewal. “Lendlease has combined iconic buildings designed by acclaimed architects with world-leading sustainability initiatives that have transformed entire supply chains and challenged large tenants to embrace green business practices,” he said. Once finished, Barangaroo will comprise three towers (collectively known as International Towers Sydney) plus two smaller timber buildings for commercial use. All together, the precinct has room for 20,000 office workers, 2000 residents, a hotel and more than 80 cafes, bars, restaurants and shops spread across half a million square metres of space. All three towers have received 6-Star Green Star ratings and a WELL Platinum rating thanks to a combination of factors. Onsite infrastructure for power, cooling, water and waste management combine to reduce the precinct’s environmental footprint. This includes 6000 square metres of solar photovoltaic panels, rainwater collection and greywater recycling, and vertical shading systems to reduce cooling needs. To add to its ambitions, Barangaroo aims be Australia’s first carbon neutral community. Steps to achieve this include reducing the carbon intensity of the reinforcing steel by 20 per cent, and recycling 99 per cent of construction waste. It’s also one of only 17 precincts worldwide chosen to participate in the Climate Positive Development Program. According to Lendlease’s CEO Property, Kylie Rampa, the PCA awards highlight the many ways Australian innovation contributes to “high quality, globally attractive places that are literally changing how entire communities and cities interact”. “These awards are testimony to our people’s talent and the drive they bring each day to their work,” she said. Learn more about the design, development and construction of the Barangaroo South urban renewal project during an offsite tour at the Australian Engineering Conference. To register, click here. Experts say the government’s allocation of $41 million seed funding to establish an Australian Space Agency is a great starting point. But will it lead to sustainable support for local industry? The 2018 budget included seed funding of $41 million over the next four years to establish the first Australian Space Agency. Of this, $15 million will be dedicated to helping Australian industry partner with international agencies to gain a foothold in the US$345 billion (AU$462 billion) global space market. According to the Chair of Engineers Australia’s National Committee for Space Engineering, Peter Moar, this announcement has made a lot of people happy. “From an Australian perspective, this is a huge investment in space,” he said. But Moar also pointed out that on an international scale, this investment is modest. For example, he said the UK and Canada have annual space budgets in the order of $150 to $250 million. “I believe one of the roles of the new space agency will be to make the argument to source funding that is commensurate with Canada and the UK as examples,” Moar said. According to Minister for Jobs and Innovation Michaelia Cash, the boost to the space industry will flow on to other sectors. “Space technologies are not just about taking people to the moon, they underpin the long-term competitiveness of many other industries, including communication, agriculture, mining, oil and gas,” Cash said in a media release. Flavia Tata Nardini, founder and CEO of Adelaide-based space startup Fleet, agreed. She stated that the Australian Space industry will touch the lives of each and every Australian, giving us the chance to play a growing role in this critical industry. “Whether we realise it or not, space technology is a huge part of our daily lives,” Tata Nardini said. The government will pump a further $260 million into improving GPS technologies for local businesses and greater access to satellite imagery. In a media release, Resources Minister Matt Canavan said more precise technology would make Australian businesses more productive, safer and more efficient. “We rely on satellite and GPS technology for just about every aspect of our lives – from Google Maps on our individual phones, through to air traffic control at the busiest airports,” Canavan said. The largest allocation ($160.9 million) will go towards improving the accuracy of GPS positioning from 5 m down to 10 cm across Australia and its waters using a satellite-based augmentation system. Another $63 million will be spent on a National Positioning Infrastructure Capability (NPIC) to make GPS accurate up to 3 cm in areas with mobile coverage. The remainder of the funding will be spent on providing standardised satellite data to better understand environmental changes such as coastal erosion, water quality and crop growth. According to Moar, this strong investment in the downstream space industry (aka data users) has left the Australian upstream space industry – those who develop and build technology such as satellites – on hold. Moar emphasised the need for more funding to the upstream space industry to allow Australia to develop local capability to build microsatellites, which are larger and able to provide higher quality imagery and data than cube or nanosatellites. This will reduce our reliance on data from space tech launched by other nations, Moar said. “Australia is world’s best at processing data from space, but we are still a long way from being able to develop our own sovereign microsatellites program-based capability that will contribute imagery and data to the rest of the world,” he explained. The government has also commissioned a review of Australia’s space industry capability in order to develop a strategy to foster its development. The expert reference group delivered their report on 29 March 2018, but at time of writing it is yet to be publicly released. According to the Chair of the Space Industry Association of Australia, Michael Davis, it is vitally important the recommendations of the expert reference group be accepted and implemented. “This will ensure that the new [Space] Agency has the necessary support from both government and industry to achieve the long term goals of industry engagement and economic development by promoting collaboration and investment nationally and internationally,” Davis said. Moar also emphasised the need for ongoing support. He said that while the $41 million investment in the Australian Space Agency was a great kick-start, he hopes that it leads to sustainable and ongoing funding for the industry. “Ideally this won’t be a false start and will be the beginning of the resourcing and underpinning of Australia’s space industry,” Moar said. Flavia Tata Nardini will be part of a discussion about how Australia can keep innovating in the startup sector at this year’s Australian Engineering Conference. To register, click here. If a robot hurts or kills someone, is the robot responsible? As robotics and AI become an increasingly potent force in society, previously abstract questions about how we should legislate them now need concrete answers. As self-driving vehicles take to the roads, and organisations and governments continue to invest in collaborative robots to work autonomously alongside humans, we need to decide who should be responsible for the decisions that robots make. An attempt to address this conundrum was made last year by the European Parliament, which passed a resolution suggesting robots be granted ‘legal status’. But recently, members of the European Council (responsible for defining the EU’s overall political agenda) and others have penned an open letter on the subject. It strongly cautioned against granting robots legal rights, and suggested that proponents of legal status for robots might have ulterior motives for laying responsibility at the feet of machines, rather than their manufacturers. The resolution was passed last year, when the European Parliament voted to grant legal status to ‘electronic persons’. Drafted by MEP and Vice-Chair of the European Parliament’s legal affairs committee Mady Delvaux, the resolution aimed to create a set of unified laws to prepare European countries for the entry of AI and robotics in everyday activities, and address concerns that autonomous machines might cause harm to their human counterparts. Lawmakers called for legal recognition of robots as a way to hold them accountable for damage they might cause, particularly to clarify liability laws surrounding self-driving cars. “At least the most sophisticated autonomous robots could be established as having the status of electronic persons with specific rights and obligations, including that of making good any damage they may cause, and applying electronic personality to cases where robots make smart, autonomous decisions or otherwise interact with third parties independently,” the resolution stated. Proponents of the resolution have been quick to clarify the legal status of robots would be similar to laws that give businesses legal rights of individuals, allowing them to sign contracts or be sued, but would not give them human rights. The open letter, which was been signed by AI thought leaders, experts and CEOs around the world, raised a number of concerns its signatories have about the resolution. Firstly, the resolution speculates that robots might have the autonomy to make complex choices and even make mistakes – an assumption that drastically overestimates their abilities. Indeed, the European Parliament’s resolution begins with references to Mary Shelley’s Frankenstein, the myth of Pygmalion and other “androids with human features”. Proponents of the Council’s open letter have also pointed to Sophia, the humanoid robot who was granted citizenship from Saudi Arabia. Noel Sharkey, co-founder of the Foundation for Responsible Robotics and one of the letter’s signatories, expressed his concerns about the impact of ‘show robots’ like Sophia on law and policy makers. “It’s very dangerous for lawmakers. They see this and they believe it, because they’re not engineers and there is no reason not to believe it,” he said in an interview with Politico. Signatories of the letter suggested granting legal status to robots would ultimately serve manufacturers looking to absolve themselves from blame in the event of an accident. “By adopting legal personhood, we are going to erase the responsibility of manufacturers,” said Nathalie Navejans, a French law professor at the Université d’Artois and one of the letter’s architects. However, while the Council opposes the EU’s proposal, the open letter advocates for “unified, innovative and reliable laws” to regulate AI and robotics, especially as more semi-autonomous and autonomous robots are likely to hit the market in coming years. Mikaela is a staff writer and recent philosophy graduate. Her thesis looked at the ethical implications of AI and its potential as a force for good. She is now only a little bit scared that robots will take over the world. In the age of digital warfare, is Australia’s cybersecurity ready? The newest combat domain is cyberspace, and Australia needs to do more to protect its digital borders and assets from threats. As an arena of war, cyberspace is new, but the way war is executed in that arena is as old as war itself. There is attack, defence, deterrence and influence. The basics simply don’t change. “These activities have been around since biblical times,” said Major General Marcus Thompson, an electrical engineer who now heads up Information Warfare Division in the Australian Defence Force (ADF) . He might be an engineer, but Thompson sees his role as one of translation and interpretation. As a professional military officer who has deployed on many overseas operations and who commanded at every level from Troop to Brigade, Thompson said he now has the responsibility of ensuring everybody in his team understands each other’s needs. “My role is two-way, helping engineers understand the requirements of the combat force and helping the combat force understand the capabilities that engineers bring,” he said. Speaking of understanding, what exactly is ‘information warfare’? It is the integration of technical and non-technical capabilities in the information environment, Thompson says. Technical capabilities include cybersecurity and electronic warfare. The non-technical side includes such areas as intelligence and information operations. “When I talk about integrating those capabilities, it’s the synchronisation, the integration and the co-ordination of technical and non-technical information capabilities, but also the integration of those capabilities with other kinetic and non-kinetic effects to achieve a specific outcome,” he said. The recognition of cyber as a war-fighting domain doesn’t mean it is a domain unto itself, completely separate from the land, air, sea and space domains. In fact, Thompson said most fighting goes on at the intersection of those domains. While cyber as an avenue for attack is undeniably interesting, the defence of our systems is far more important, Thompson says. It’s a far greater challenge, so deserves greater time and effort. The act of resisting attack can be broken up into three main areas. The first is protecting yourself and fellow personnel. “Self-defence is everyone’s responsibility. It is cultural, it is about awareness. It’s that, ‘Don’t be the person to click on the link in the phishing email’ piece, from a cyberspace operations perspective,” he said. A non-military example is the recent news about the dangers of fitness apps such as Strava. It’s great that you do regular exercise, but do you really need to show the world exactly where you run and when you run? The next area of defence is passive defence, the domain of network operators and communicators. This is the piece where he says you make sure you have adopted all of the best practice recommendations for your system. “With these measures you might stop 95 per cent of attacks,” he said. “Are your patches up to date? How many people have administrator rights? Are you monitoring your network or your mission system sufficiently closely that you notice anything unusual? As an electrical engineer, it’s what I would refer to as ‘basic network hygiene’. Number three is active defence. This is about being active within networks in such a way that you quickly identify and respond to things that shouldn’t be there. Major General Marcus Thompson, who heads up the Australian Defence Force’s Information Warfare Division. Major trends in the cyber world right now are around the understanding of the arena, as opposed to the technology in the arena itself. “What I am seeing and sensing in terms of trend is a greater acceptance of the risk of attacks in the information domain. It’s now accepted, and that’s not just a military view,” Thompson said. That is partly why Thompson talks about cyber defence in the three areas of ‘self-defence’, ‘passive defence’ and ‘active defence’, he explained. It’s simply to bring some structure to the conversation. “There are some folk who might have a virus checker on their personal computer, and some folk who want to go straight to more advanced techniques that are probably the exclusive domain of government,” Thompson said. Thompson is looking forward to the Australian Engineering Conference (AEC) to be held in Sydney in September, where he will be a keynote speaker on cyber and space security. In such a fast-moving industry, he said a new development the day before his speech could change it completely. “At the AEC 2018 I’ll certainly speak as an engineer about the role of engineers in this space,” he said. Those capabilities are being developed to engineer an advantage. If young Australians are being put in harm’s way, Thompson said, the ADF wants to give them the very best tools to survive and succeed. “Part of that is understanding what the future operating environment might be,” he said. The future probably won’t be a dystopian nightmare, but it feels like the world is dangerously close to the edge. Engineers will be crucial to keeping us from tipping over, says Professor Elanor Huntington, Dean of the College of Engineering and Computer Science at ANU. Professor Elanor Huntington will be taking part in a panel discussion at this year’s Australian Engineering Conference in Sydney.